As well as entertaining us, a trip to the flicks to watch the latest Blockbuster release is a fun and enjoyable experience, a chance to sit back, relax and be transported to another world for a couple of hours and escape the hustle and bustle of our every-day lives. But, as auctioneers Trevanion and Dean discovered recently, one collector took a trip to the movies to a whole new level. As auctioneer Aaron Dean explained ‘On an every-day basis, I am honoured to be invited into people’s home to view their collections, but nothing quite prepared me for what I saw in this particular house! It was quite a cinematic experience, everywhere I looked were original movie posters from the 1950’s onwards, it was a film-goers delight of legendary flicks, Oscar winners and iconic scenes, it was quite extraordinary and felt a bit like a Hollywood wall of fame’. His fascination with film continued into his early 20’s when, as a drummer touring the UK with bands in the 1960’s Alan explains ‘It was quite a nomadic life, we used to head out on tour buses with the group, we’d arrive at the venue and the roadies would set up the stage, so I used to take myself off to the local picture house to watch a matinee before the show started’. Alan has never stopped watching and collecting, to the point where he has now assembled a comprehensive collection of over 3000 film posters, lobby cards and other film related ephemera. But ‘It was time to start refining the collection, so I called in Trevanion and Dean to help me’ explains Alan, much to the delight of partner Aaron Dean who, as a fellow film buff, was only too delighted to start to help Alan in dispersing with his collection. In 110 carefully selected lots, Aaron and Alan have put together a selection of posters and lobby cards that will appeal to both the amateur enthusiast and serious collector. From an era spanning from 1955 (The Ladykillers – a classic gangster Eeling comedy starring the great Alec Guinnes, Peter Sellers and Herbert Lom) to 2001 (Harry Potter fans will be delighted with a poster and stills from the Philosopher’s Stone). The collection covers broad genres such as Horror (1968 Dracula Has Risen From the Grave), Western’s (Custer of the West, A Man called Horse, The Man Who Shot Liberty Valance), Epic Historical Classics (Spartacus) and Comedies (Carry On Girls) to classic Disney films such as the 1964 Mary Poppins starring Julie Andrews, Gangster epics such as Steve McQueen’s Bullitt, The Godfather, The Godfather II and III, a whole host of Bond’s (Dr. No, Thunderball and Goldeneye) and controversial films such as A Clockwork Orange and The Fly. There is certainly a lot of choice for both film enthusiasts and those who purely want a momento of their favourite film – just like Alan did, all those years ago. ‘It is a fantastic collection’ explains Aaron Dean ‘One that has been a joy to catalogue and research with Alan’, and your favourite? 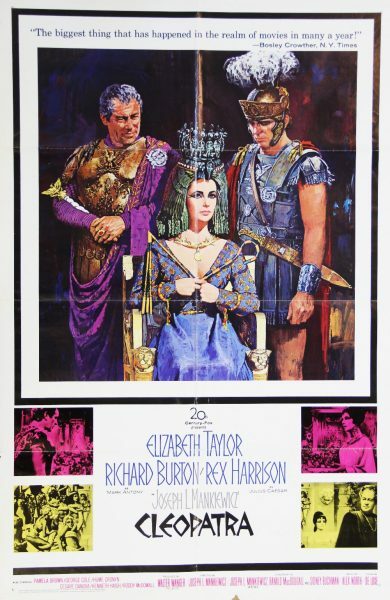 ‘My favourite would have to be the poster for Cleopatra, the 1963 epic which brought together the explosive pairing of Elizabeth Taylor as the Queen of Egypt and her future husband Richard Burton as Marc Antony, who brought more headlines with their blossoming romance than the budget problems the film was plagued with’. Indeed it was, and it proved to be a tremendous financial disaster for 20th Century Fox. Taylor, already the highest-paid performer in the history of Hollywood at $1 million, had her own costume wardrobe budgeted at almost $200,000 alone, and with numerous cost over-runs, extravagant sets and thousands of costumes for the cast, the film was the most expensive up to that time at a record $44 million (about $360 million in today’s money), from an initial budget of $2 million. Cleopatra was the highest-grossing film of 1963, earning box-office of $57.7 million in the United States and Canada (equivalent to $472 million), yet lost money due to its production and marketing costs of $44 million, making it the only film ever to be the highest-grossing film of the year to run at a loss. What is fascinating and instantly noticeable in this collection, is how this incredibly effective marketing tool has changed over the years. Our modern eyes expect a poster to be a ‘still’ from the film itself, yet early posters were designed by artists, specifically commissioned by Hollywood to create a poster that sent a message ‘See This Film’, these incredible images and arresting compositions are what have led to film posters being regarded as art work in their own right, and they can, like a fine painting, be hung in your home or office and be enjoyed as it accrues value, a cool reminder of a filmic world that always exists forever on a silver screen near you.